I've been wanting to do this type of post for some time now and then after seeing Zoellas post it finally jogged my memory and so here it is for you! I don't exactly have the most glamorous bedside cabinet, and to be honest it's not a bedside cabinet but we are stuck for space so I had to improvise lol. This is another little vintage pot which has been in my family for years, this was my great-grandmothers and my grandad kindly gave this to me. It's the perfect size to store my little lotions and potions in. I always delve into this pot every evening and apply lip balm, hand cream and a little something for my cuticles! I use to have my Caudlie in my hand bag but the weather has been so rubbish lately I've now moved it up by my bedside so I can spray it first thing in the morning. I use the Lush massage bar or the TBS beautifying Oil before bed on my arms and legs. TBS hemp hand cream is amazing, this is my second tube and as you can see I'm almost out! Being a candle addict that I am, this post wouldn't be complete if it didn't feature a candle. This is the ROJA Rose De Mai, the smell is intoxicating. 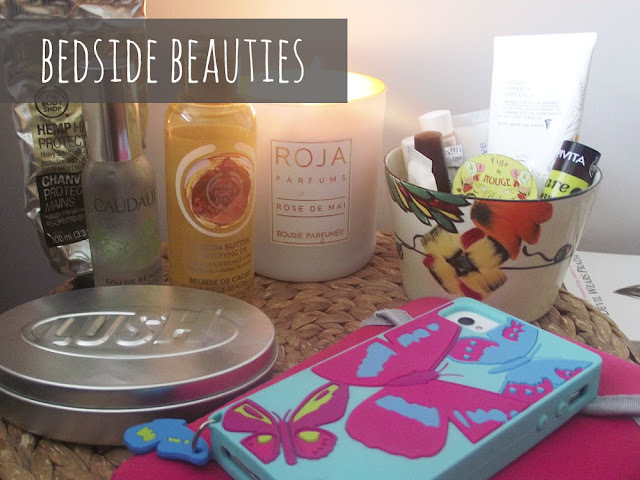 Right I know these next two items aren't exactly beauty related but they do live here by my bedside so I wanted to add them in this post. I don't normally TAG anyone in blog posts but I tag anyone who would like to share their Bedside Beauties. I think this is a really cool blog post and I would love to know what items you reach for before bed and in the morning. Omg, your bedside puts mine to shame! Lol, I like how peaceful & neat it is. The bright colors & items really give off a great mood. I think I'll look into changing things around in my room. Thanks!